Bechamel or white sauce is the mother of all sauces. 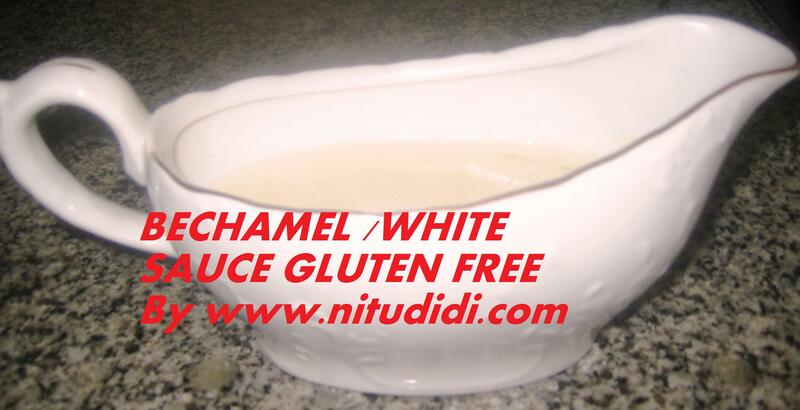 It is used as a base for many sauces, or as an ingredient for making croquettes, pies, lasagne and canneloni etc. It is simple to make if you follow a few basic rules. I have been asked for this recipe by many of my followers and decided to do a video tutorial also so you all can see how easy it is. I have made it gluten free for the celiacs, but you can use ordinary white or whole wheat flour if you wish. Chop the onion in juliennes. Heat the butter in a thick bottomed pan and sautee the onions and peppercorns till the onions start changing color. For Jains, please omit the onions and you can use a bit of celery instead for flavour. Once the onions change color, remove them from the butter and transfer onto a plate. Add the cornstarch and cook for a few seconds. Remove from heat and stir in the milk slowly mixing non stop till the mixture is well blended. Return to heat and cook stirring continuoulsy till the sauce thickens. Add salt to taste . This is your basic white sauce. Now you can add herbs, black pepper, etc. For a cheese sauce add grated cheese. For a black pepper sauce you can add lots of crushed black pepper. For a mushroom sauce you can add sauteed mushrooms. For an onion sauce just blend the sauce in the blender with the sauteed onions. For a tangy sauce you can add ketchup and chilli sauce. If you do get lumps in the sauce for any reason, dont panic… just let it cool and put it in the blender. That should sort it out. This entry was posted in Everything Vegetarian, Floury Matter, Gluten Free, Jain recipes, Low Cost, Quick Recipes, Sauces and Chutneys and tagged bechamel, gluten free, white sauce. Bookmark the permalink.